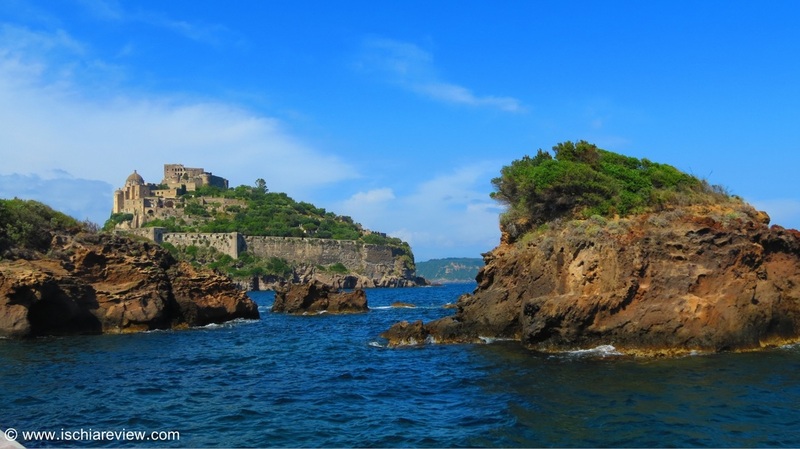 Guide to Cartaromana Beach in Ischia Ponte with photos, tips and directions. Cartaromana is a small but pretty beach with fantastic views of Castello Aragonese. The beach is in an area some distance from the main town of Ischia Ponte but is certainly worth the walk. Many visitors (including myself!) find it a little bit difficult to find Cartaromana beach and there are several reasons for this. Firstly, there are in fact two Cartaromana beaches, an old (vecchia) and a new one (nuova). Nuova Cartaromana is really just a series of drop-off points for boats visiting Ristorante Eden and the hotels around Michelangelo's tower such as Hotel Delfini. You certainly wouldn't describe these places as beaches as there are just small areas where you can enter the water around the rocks. The beach that I'm describing on this page is in fact Vecchia Cartaromana (old Cartaromana) and is in an area further away from Ischia Ponte than the Nuova Cartaromana as described above. To make life just that little bit more complicated, the local brown road signs start near Castello Aragonese and direct visitors towards "Spiaggia Cartaromana" (Cartaromana Beach). However, by following these signs you will find yourself at the viewing area ("belvedere" in Italian) near Hotel Strand Delfini. This is a lovely picturesque place but it is not Cartaromana beach. You will also see signs in a hotel pointing you towards "Spiaggia Cartaromana" but you cannot walk there from this point. The signs actually direct you to a small boat which will take you to Vecchia Cartaromana but you will have to pay (I will find out costs for this and report back) for this. You can though, walk to Vecchia Cartaromana without the need to pay for a boat to take you. So, (and I hesitate to say this), follow the signs from Ischia Ponte near Castello Aragonese but just for the first part. If you imagine you are walking away from the castle and it is behind you, walk through the main town until you see one of the brown signs saying "Spiaggia Cartaromana", which will be directing you to your left and up a steep hill. Depending on your level of fitness, the walk up the hill could take between 5-10 minutes before you come to a T-Junction with another brown sign directing you to go left. Do not go left here (at least don't if you're planning on going to the beach in the photos above). If you do go left here you will walk towards Michelangelo's tower and the viewing area near Hotel Strand Delfini. Instead, carry on up the hill for around half the distance of the hill you just climbed, something like a few hundred metres I would estimate. You will eventually come to a small "Conad" grocery store on the left hand side of the road. Do not go as far as the store, instead take a left along the road that precedes it and continue until you reach a large cemetery. At the cemetery turn left and you will start to gradually descend down a hill. Continue along this road when it bends round to the right. You will eventually start to see the beach in the distance with the Hotel Da Maria sitting above it and to the right. This is the direction you now need to follow. You shortly come across a path that you can see will lead you down to the beach. This path is fairly steep and certainly requires at least an average level of fitness, especially on the way back up. Once you're down at the beach you'll see the lovely Ristorante Da Maria and after your mini walking adventure you'll probably be just about ready for a bit of a rest and a snack, not to mention a well-earned dip in the sea! Be sure to speak to Maria and mention that you found the restaurant on Ischia Review and she has promised me that she'll give you fantastic service. I must stress that Cartaromana is a beach that should be enjoyed by those who like walking. The walk is lovely with some fantastic scenery and will take between half an hour to 45 minutes from Castello Aragonese. For those of you looking for a beach that's easier to access then I would recommend La Mandra or Fisherman's Beach which are both closer to Castello Aragonese. I hope that helps, let me know how you get on by sending me an e-mail to info@ischiareview.com to share any other traveller's tips you find along the way!